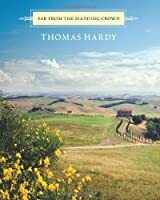 We don't have a description for Far from the Madding Crowd, but if you head over to Amazon they'll be able to tell you what this book is about! I love HARDY!!!!! Read everything I could get my hands on back-to-back 1977. This remains one of my favorite books of all time, and yet, the plot is but a hazy memory. I've read it two or three times and intend to read it again. All I know is I love this book.